What is recycling? Recycling is the separation of specific materials, usually including plastic, metal, paper, cardboard, from garbage and diverting it to a facility that will repurpose it for reuse. Recycling also offers a sustainable solution to regular waste streams by lowering our input into municipal landfills, and helping extend the expected life of a landfill by decades, drastically lowering our environmental impact. Single Stream recycling, the most common option for many waste haulers, along with the preferred choice at Reliable, allows customers to put all their recycling in a single container that is then transferred to a recycling center and separated by a team of specialists. This method has pros and cons, and the cons are incredibly important to note. 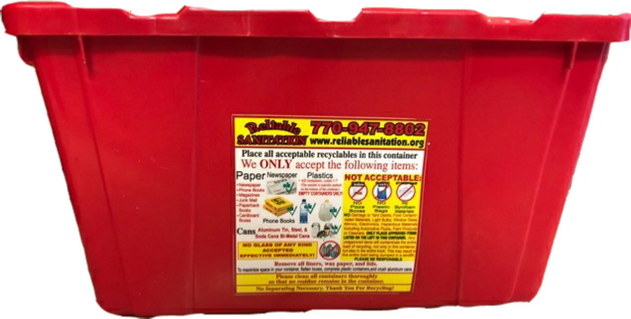 •One container for all recycling materials. •You should not bag your recycling, just place it in the bin. •No separation is required. If it’s accepted, throw it in the same container. •Most people are unfamiliar with the fact that different facilities accept different materials. It’s incredibly important you know what you can recycle and what you can’t. Click here for Details!